If music is an important part of your life, you deserve the Audeze Deckard Headphone Amplifier / DAC Amp / Preamplifier - a powerhouse of a headphone amplifier combined with a high-performance DAC. CNET raves, "The soundstage is spacious, and never 'stuck' to the speakers; bass is full, defined and deep, and best of all the treble is refined and pure." The Deckard headphone amp DAC features front panel volume control and switches to choose gain and input so you can use it as a great line-level preamp to drive your whole desktop system. Experience exciting and dynamic sound with beautifully rendered tonal colors that make music come alive, with a single-ended class-A output stage and good damping characteristics to control the strong and tuneful bass. 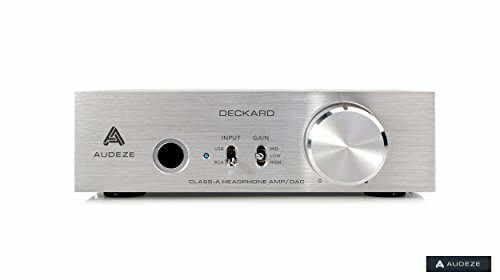 From the makers of the elite Audeze LCD 3 and Audeze LCD 2, the Audeze Deckard Headphone Amplifier / DAC Amp / Preamplifier offers outstanding quality, design, usability, and Audeze's signature sound. This impressive headphone amp handles 16 - 32-bits and 44.1kHz - 384kHz sampling rates. Its power handling capabilities at lower impedances is ideal for Audeze's planar magnetic headphones, but it drives any headphone with power to spare. This Audeze DAC amp has a style and build that is simply outstanding, with substantial heft and brushed aluminum finish. The Deckard has input and gain settings with a smooth-turning volume control and puts out 4W of incredibly low-distortion sound for more air, separation and sound staging abilities. POWERHOUSE HEADPHONE AMP - If music is an important part of your life, you deserve the Audeze Deckard Headphone Amplifier / DAC Amp / Preamplifier - a powerhouse of a headphone amplifier combined with a high-performance DAC. PRO-GRADE SOUND - Experience exciting and dynamic sound with beautifully rendered tonal colors that make music come alive, with a single-ended class-A output stage and good damping to control bass. This impressive headphone amp handles 16 - 32-bits and 44.1kHz - 384kHz sampling rates. BY AUDEZE - From the makers of the elite Audeze LCD 3 and Audeze LCD 2, the Audeze Deckard Headphone Amplifier / DAC Amp / Preamplifier offers outstanding quality, design, usability, and Audeze's signature sound.